Where to begin. There is such a long list of U.S. allies ruled by regimes dedicated to repression and violence, especially targeting those who effectively resist in word or deed. Depicted above is celebrated environmental organizer Berta Cáceres, who was assassinated March 2, 2016 at her home in Honduras. You remember Honduras: the Central American republic whose elected government was toppled by a military coup enabled by U.S. complicit support in 2009 and since then. The illegitimate government of Honduras continues targeting indigenous leaders like Cáceres on behalf of corporations greedy for access to resources. In our worldview, we are beings who come from the Earth, from the water, and from corn. The Lenca people are ancestral guardians of the rivers, in turn protected by the spirits of young girls, who teach us that giving our lives in various ways for the protection of the rivers is giving ourlives for the well-being of humanity and of this planet… Let us wake up! We’re out of time. WE must shake our conscience free of the rapacious capitalism, racism and patriarchy that will only assure our own self-destruction. Our Mother Earth – militarized, fenced-in, poisoned, a place where basic rights are systematically violated – demands that we take action. The U.S. has a long history of rapacious policies in Central and South America, perpetrated by regimes with either D or R after their names. Reagan, both Bushes -- all were horrible neighbors to the people south of the U.S. border who were standing in the way of profits for their corporate supporters. And both Obama and former Secretary of State Hillary Clinton have Cáceres' blood on their hands. Onward to Saudi Arabia. 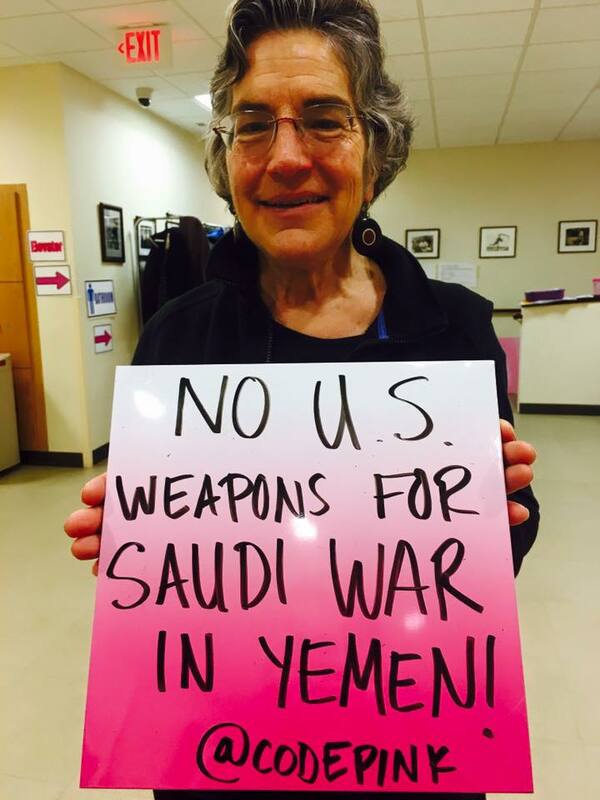 Last weekend CODEPINK held a summit in Washington DC to examine this strange U.S. bedfellow. "Pope Francis condemns massacre of nuns & workers at Yemen retirement home http://aje.io/nxcu"
the House of Saud has backed and trained ISIS terrorists fighting in Iraq and Syria, and has itself been bombing targets like nursing homes in Yemen. Let's end our examination of dreadful U.S. allies with Turkey, long a NATO bulwark against Russia's influence in the region. The ongoing civil war in Syria has provided the pretext for Turkey to shell Kurdish units outside its border while a military blockade disguised as a "curfew" has included civilian massacres in Sur, Diarbakir in Turkey's southeast. One hundred and seventy-eight bodies have so far been collected from the “Savage Basements” in the Cizre district of Sirnak. Yet, the family members who were asked to identify the deceased report that the bodies were burnt beyond recognition. Furthermore, bodies have been intentionally transported to various other cities in Turkey for autopsy procedures, which in turn have aggravated the suffering of the family members. Meanwhile, U.S. ally Turkey is making international news for its crackdown on journalists, many of whom have been jailed on criminal charges. Ironically, these charges often include terrorism. Several major media outlets have been closed down entirely. It would take quite a long time to complete a list of the U.S.'s odious allies and their outstanding crimes against humanity. Israel, Jordan, and South Korea spring to mind in this regard. The burning questions U.S. citizens should be asking themselves is why does my government support these regimes, and does this bode well for my own security and civil liberties in the days to come? Most will not ask these questions, because they rely on corporate "news" to bring them what little information about the world they require. Mostly they are served up hype about the presidential primary season plus celebrity gossip. America is so exceptional it doesn't need to concern itself with the actions of its friends. Because, really, who among us can find these countries on a map anyway?